Quality Warehouse operates in the New York and New Jersey piers on a daily basis, providing import and export services to the Philadelphia piers, and other locations. We have concurrences with all steamship lines, and we are a member of the Uniform Intermodal Interchange Agreement (UIIA). Based on your needs, Quality Warehouse strips, stuffs, or transloads containers. Our quality service and extremely competitive rates can’t be matched when it comes to our import logistics services! One of our longstanding clients is a prominent broker/merchant of paper and pulp. This client imports paper from Europe in rolls weighing up to 6200 lbs. 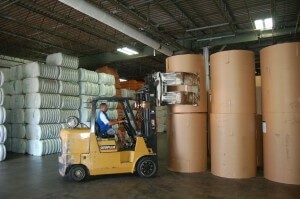 Each roll may be 40″ to 65″ in diameter. Quality Warehouse picks up the client’s containers from the port for short term storage and order fulfillment. Using specialized clamp trucks, Quality Warehouse fills orders, assembles loads and distributes the paper rolls to customers nationwide. A typical paper shipment includes 56 containers divided into 75 truckloads going to 13 destinations. It takes us 4-5 days to bring the containers into our facility and 1-3 days to process the containers into individual shipments for transport to customers.